My sister Diana and I standing beside my mother’s memorial birdbath. My last blog was a tribute to my mother. I am now writing about her again to share a part of her legacy. When Mummy passed away in June, one of the first messages I received was from Hilary Sherlock, who is the principal of a small school (the STEP Centre) in Kingston for children with developmental disabilities. She spoke of Mummy’s courage and determination in her work and research for persons with disabilities in Jamaica. As the weeks passed, we received so many more similar messages, and while I knew of my mother’s work, I had not realized how profoundly she had affected the lives of so many people. At her memorial celebration, we took up a collection for the STEP Centre and for the successor to Mummy’s own non-governmental organization for children with disabilities, 3D Projects. It wasn’t a large sum of money, but Hilary’s idea was to use it to buy a birdbath for the garden at the STEP Centre. 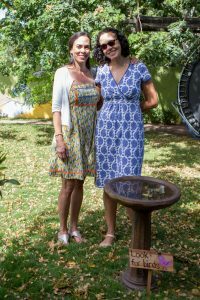 On a recent visit to Jamaica my sister Diana and I visited the STEP Centre to see the birdbath, and we were so moved by the wonderful learning garden where it was placed. There was a large, colourful mural, and each tree and shrub had been lovingly planted in memory of someone who had helped bring the STEP Centre to reality. Even with Mummy’s tireless work and the unflagging commitment of so many other people over the past 40 years, services for people with disabilities in Jamaica are still far from adequate, given their needs. But to see Mummy’s legacy thriving so beautifully was a poignant reminder of the power of one person to leave a positive mark in this world, and an inspiration to me to move forth in my work and in my life with a sense of purpose to leave my own legacy, however small. Let us all be grateful for the gifts that we have been given and share them with whomever we can. That way we can leave behind a positive footprint of our lives and in doing so make an impact that will benefit others for the years to come.